But I think that this would work better if we moved it to maybe 3 books in the future it would be better. We have all these many factions, all of these different groups and districts and people all with their own grievances against the council along with other supernatural beings like the River Giants –but all of them feel a bit out of the blue. They’ve all just appeared: the relatively narrow story we had about Carlos and his close associates has now exploded to include all these vast new cast members who are either completely new or had relatively minor roles before. But the way they’re written almost implies we should know them or be invested in them or even get the conflict each personally faces. It feels almost like book three there was a sudden decision to tell a whole different story but there were these two other inconvenient prequels to fit in somehow. I think that’s another issue that is more than a little jarring. No-one has ever really been a fan of the Council before now, certainly, but full on civil war rebellion? That was barely on anyone’s radar. It feels like an entire new story has just swooped in and mashed everything aside, no, we’re telling this story now. It almost feels like the author can feel that as well – because there are bits of the last two books somewhat pasted on – but it feels like that. Like the Ngks, or Kia or Reza or the whole process that turned Carlos and Sasha into the half-dead people they are: these were major elements of the last few books which felt kind of taped on without them being integrated and the whole ending feels kind of confused and mushed in trying to drag elements of this book together. Similarly there’s Caitlin – who beyond being a terrible poster child for the so many clueless self-absorbed people out there and bringing with her some genuine sinister power also feels… odd. I mean, why is she here? What does she add to a fight between the Council and her ghosts. We spend a lot of time behind her eyes but in terms of the battle all she is is a weapon… and it feels like another thread from a past book that has been pasted in to try and make the series feel more coherent than it is. In addition to the racial inclusion we have some LGBTQ characters. Baba Eddie continues to be an almost non-existent support character which is never a great trope. While Reza is there and is awesome she was the utter briefest of appearing characters. That leaves us with Krys, a bisexual ghost woman who is fun in many ways, determined, strong, dangerous as well as a fatter woman which is definitely something we don’t see often. But she also felt so out of place. Despite having the odd chapter which centred her, she seemed to add very little to the other characters, very little presence in the story. One of her friends, Redd, is a trans man who is pretty much in the same position but even more tangential to the actual plot. They were just there and I had no real idea why they were there, what they were supposed to actually add to the main story. they had no history before this, their storyline little real presence during this – and since this feels like the last book in the trilogy, I can only assume no presence after this. It added to the frustrating patchwork feel of this book. I’m left feeling frustrated and confused. I love these characters, I love this series and I like very much the idea of this grand show down. But why is it here? Where did it come from? Where’s the build up? Who are all these people? Why are all of these characters wandering around the periphery of this story without actually being involved in it? Basically, why here, why now and why like this? 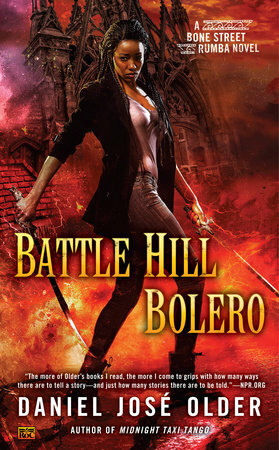 I keep checking every site I can to check if I’ve missed a book – because that’s what it feels like: like there should be something between Midnight Taxi Tango and Battle Hill Bolero.